This page provides an overview of the 2013/14 Student collection (C13051). This should be used alongside the C13051 coding manual, which provides more detailed, technical information about the collection. What is the Student stream? The Student stream collects data about students studying at higher education providers in the UK. Details of which students need to be returned to us are included in the Coverage document found in the Coding manual. Where can I find further help with the Student record? Who are Liaison? Following the October 2012 consultation, changes were agreed that are being carried forward for the Student record 2013/14. Documentation summarising the main changes to the Student record for 2013/14 since 2012/13 is available from the C13051 coding manual. Please note that any changes made to the 2013/14 Student record after the first release of the manual will be documented in the Revision history, so you should reference this web page also. 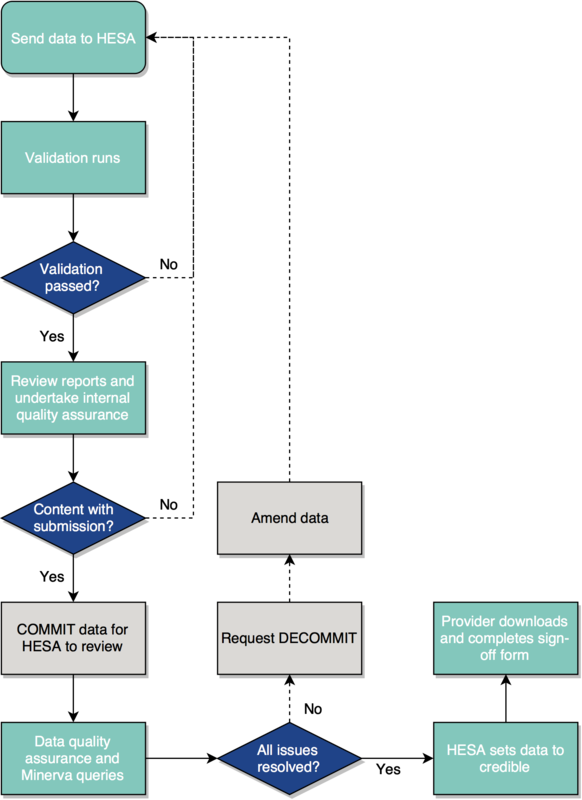 During data collection the suite of reports containing management information for review to assess data quality will be generated if at all possible regardless of whether a successful TEST_COMMIT or COMMIT transaction has been processed. It is hoped that this will further assist institutions in the validation process. Note that the following list of changes is not exhaustive - please refer to the Revision history for full details. Where you select ‘will fix by last submission’ the query will remain listed in the outstanding issues page until you reclassify the issue as ‘ready to be fixed’. The ‘I have a related question’ option should be used where further clarification on the query is required before you can provide a response. ‘More than one of the above apply’ should be used in cases where the query contains multiple elements some of which may, for example, be genuine and others that perhaps require resubmission. You are reminded of the importance of engaging with the data quality process and ensuring that detailed responses are provided in a timely fashion to ensure that the data is fit for purpose. A new entity 'FinancialSupport' has been added on Instance to capture the financial support given to students, for OFFA purposes. Version 1.5 of the coding manual, released in June, contains additional guidance regarding the data items, including the treatment of loans of equipment. We will be contacting institutions to confirm whether loans of equipment have been included in the Student return. A new field CARELEAVER has been added to capture whether a student is a care leaver or not. This will be included in the UCAS *J file, however institutions that record care leavers for internal purposes should use code 01 where applicable. You should be aware that there may be a need for some recoding where a blank value has been supplied by UCAS. A new entity 'Mobility' to record the mobility experiences of students has been added to Instance. This entity contains four new fields: Mobility.MOBTYPE, Mobility.MOBDURA, Mobility.MOBLOCA and Mobility.MOBSCHEME. REF.UOA2014 has replaced RAEData.UOA2008 to reflect recent changes to the Research Excellence Framework (previously RAE). To ensure consistency in the data returned we encourage you to liaise with colleagues responsible for the REF as well as those undertaking your institution’s Staff return. We will carry out cross checks between the Staff and Student records to ensure that the REF units of assessment are consistent. A new SSN item has been added to display a breakdown of students and reports on students who start and leave within 2 weeks at an institution. Item 4a has been introduced to report the breakdown of reported mobility. Item 16 Financial Support has been introduced for C13051 to capture the financial support received by all students for the purposes of the Office for Fair Access (OFFA). A new 'unrestricted population' worksheet has been added at the request of institutions to provide a total instance count. Item 12 ‘Average Instance FTE' has been broken down further separating out students who have withdrawn and suspended. We have recently introduced the HESA Identity System (IDS), which will serve as a single-sign-on portal governing access to all our websites. This means that you will only have one username and password to access all of our services. Use of this portal will be rolled out across our web applications over the coming months. The first service to use IDS for authentication is Minerva. So, in future, when you go to the Minerva site, you will be redirected to the Identity site, where you will log in, and then be redirected back to Minerva. To assist institutions in the role of review of committed data we provide a guide to assist in the interpretation of check documentation. This guide is available from the coding manual. We are undertaking a post collection analysis project to compare the content of Instance.GROSSFEE and Instance.NETFEE as provided by the HEI and by SLC. The results from linking 2012/13 data show that 96% of the SSNs submitted in the HESA record (for full-time undergraduates) matched with data received from the SLC. Thus there is a high degree of confidence in the linking process for the core full-time undergraduate population. However, outside of this core population, lower percentages of matching were found. The project continues to look into these discrepancies with assistance from a number of HEIs. For the 2013/14 data collection the instruction to institutions is unchanged from 2012/13. Therefore in addition to returning Instance.GROSSFEE and Instance.NETFEE for all students not applying for student finance (i.e. no Instance.SSN exists) where FEEREGIME=20, institutions may also wish to complete Instance.GROSSFEE and Instance.NETFEE for all students for whom they have returned a Student Support Number (Instance.SSN), although the latter remains optional. A record is required for all students that have applied for a loan with the SLC where the attendance has been confirmed to SLC on an SLC attendance confirmation date, even if the student started and left the course within the first two weeks. A type 08 reduced record is acceptable for these students. If a student leaves the HEI part the way through the instance year, HEIs must provide the annualised amount for the course in Instance.GROSSFEE and Instance.NETFEE. The SLC will also supply the annualised fee in this scenario. For non-standard years where it is not known which or how many modules the student will elect to take in HESA year two of the year of instance, HEIs should return the fee based on modules started in the reporting year. There is no requirement to provide Instance.GROSSFEE and Instance.NETFEE for incoming exchange students or dormant students. The table below shows the typical values expected for groups of students by domicile and location of institution. This table is indicative only. You are reminded that you should scrutinise the IRIS system outputs to ensure that data submitted is correct. HEFCW will not be routinely examining the output. However, if there are any questions about the output from IRIS or if you would like the output to be scrutinised by HEFCW, you should contact the Statistics Team at HEFCW. You are reminded that you should scrutinise the IRIS system outputs to ensure that data submitted is correct. HEFCE will be examining the output and where necessary raise queries which institutions are expected to respond to. You are reminded that as part of your data checks you should look at the IRIS system outputs. If there are any questions about the output from IRIS, you should contact the Funding Policy Group at the SFC. Following the submission of the C13041 Institution profile return, this data will then be used to validate cost centre data used in the Staff, Student and FSR data collections. Details about the collection can be viewed in the coding manual. Student record contacts have been given read-only access to C13041 so that they can view the Institution profile data record. Student record information is included in some of the data items contained in the C13042 Estates management record. Those data items used are detailed within the student and staff counts fields of the Estates record. The record contact is the first point of communication during data collection. Access and PIN codes will be sent out to your institution's nominated record contact. If these details have changed please ensure you notify Liaison to prevent any delay in the receipt of these codes.